It's the store-bought rotisserie chicken smackdown! Ladies and gentleman! 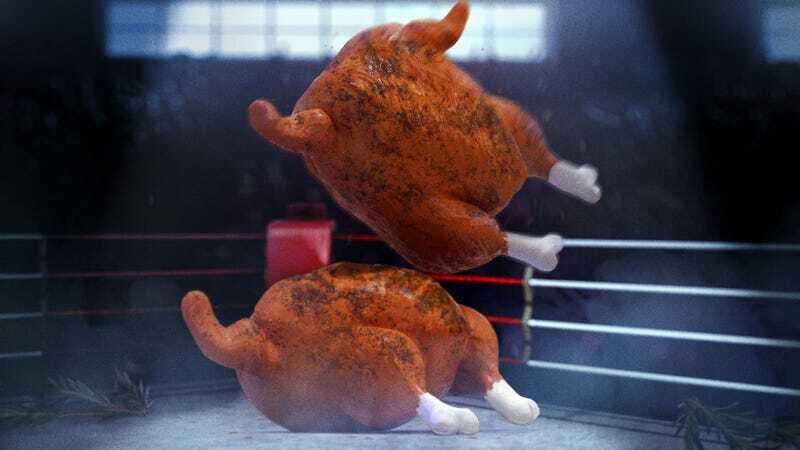 Live from Takeout Memorial Coliseum, we’ve got a real slobberknocker of a card for you, pitting three of the hottest store-bought rotisserie chickens against each other in our taste-test main event! Introducing the first: From Issaquah, Washington, weighing in at a whopping 1,723 grams, this wholesale warehouse has been pushing rotisserie chicken alongside its $1.50 hot dogs and five-gallon drums of mayonnaise... it’s Costco! Its opponents: Originally from Austin, Texas, this natural foods-store-turned-national powerhouse recently found a new valet, the lovely Miss Amazon, and is banking on the success of its rotisserie chicken sales... weighing in at 1,192 grams, it’s Whole Foods! And finally: Hailing from Newton, Massachusetts, it’s a chain restaurant best known for its small but mighty roasted chickens! A cruiserweight at 740 grams, it’s Boston Market! This match is scheduled for one-fall with a 30-minute time limit. Ring the bell! Tasting notes: First off, the size! This heavyweight bird is nearly four pounds cooked. Usually larger chickens are more easily dried out, but that’s not the case here. Very good moisture in breast meat, even down to the tenderloins. Abides by the less-is-more flavoring philosophy—we’re only tasting chicken + chicken fat + salt. Succulent and moist, full-flavored with the essence of chicken coming through. Tasting notes: Tastes like the type of chicken we’d roast at home. Opting for the traditional spicing (there are rotating flavor options), the meat here is noticeably drier than Costco’s—not just in this one instance, but all the other times we’ve tasted a Whole Foods rotisserie chicken. The meat is rather plain, but compensated by the assertive steak seasoning-like flavoring of the pepper-speckled skin, which is almost too salty. Tasting notes: Half the size of Costco’s rotisserie chicken and more than double the price—but good god almighty, this is one delicious chicken. The skin has a tacky glaze that’s savory and slightly sweet with just the barest hint of garlic, and this flavoring is seeped deep into the intensely moist interior meat. (When ordering this, skip the standard chicken gravy and opt for the beef gravy). Ladies and gentlemen, we just witnessed a five-star instant classic. In the closing moments of this match, Whole Foods was eliminated via count-out outside the ring, and we were down to Costco and Boston Market trading blows in the center. Boston Market’s rotisserie chicken may have been objectively more delicious, but when factored with the better price and double serving size of Costco’s, Boston Market couldn’t make up the difference, and eventually, was forced to tap out. And so your winner, by the cross-face chicken wing submission, is your newly crowned champion: Costco!